The Fontana dei Quattri Fiumi pays respect to the rivers Danube, Nile, Ganges and Plate, which also represent the four major populated continents of the world at the time (you play art/geography student and match them up). Here's an example of how Rome builds itself anew on top of its own ruins: The Stadium of Domitian once held up to 30,000 spectators for athletic events, which were named the "Agoni Capitolini." 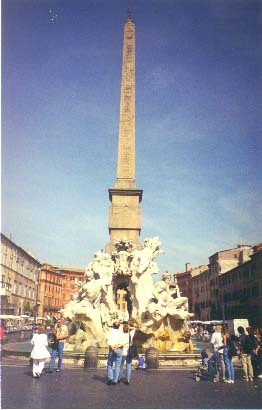 The name of the piazza evolved from "Agoni" to "n'agona" to "Navona" as the seating areas disappeared and were replaced by apartments and commercial buildings. The present-day buildings now preserve the original oblong shape of the stadium. By the way, did you know that there are currently more obelisks in Rome (thirteen) than there are in Egypt?